I'm somewhat of a fan of Richelle Mead's Vampire Academy books (okay, and the spin-off series, Bloodlines), and I followed the making of the Vampire Academy movie with some interest. 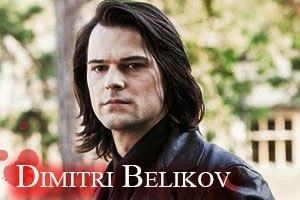 Despite my trepidation over the length of Danila Kozlovsky's hair (he plays Dimitri and is otherwise hot but THAT HAIR OMG), I wanted to see the movie. I didn't make it to theaters, but when it was released to DVD and iTunes, I downloaded it. Despite a rocky start in the story (easy on the exposition in dialogue, there) and the somewhat hilarious special effects in the Strigoi (it was somewhat better than the original Buffy movie), I enjoyed it. The accents and the set and the hilariously awkward (and awkwardly hilarious) lines kept me entertained, and I hate to admit, Zoey Deutch as Rose was much better than I was expecting. The filmmakers left the ending wide open for the next installment in the series, Frostbite, aka the part of the saga where Adrian hits the scene. Adrian really doesn't get my pulse pounding, but fans everywhere have been having ovary explosions over him for forever, which is why I am not entirely surprised that an indiegogo campaign has been started to get the second movie into production. What's cool about this crowd funding shindig is that the filmmakers have already secured financial backers for the vast majority of the project, as long as they can demonstrate that there is enough fan support. Apparently the monetary value of that fan support is a cool $1.5 million. The campaign has been running for a few days and they've managed to put together about $150,000 (Veronica Mars this is not), but they've got a ways to go. I gamely threw in $10 (because I am grad school, and therefore poor), but if you are a fan and want to see this movie made, now's your chance! It expires September 5th! And hey, the perks aren't terrible either. Even if you're broke like me, $30 gets you access to exclusive updates and a digital download of the movie when it hits theaters. That's like, the cost of your movie ticket and the cost of the movie itself, presuming you were already going to buy it. Or, if you have buckets of money, you can pay for a trip to the set! The first movie was better than I expected, I'll admit.